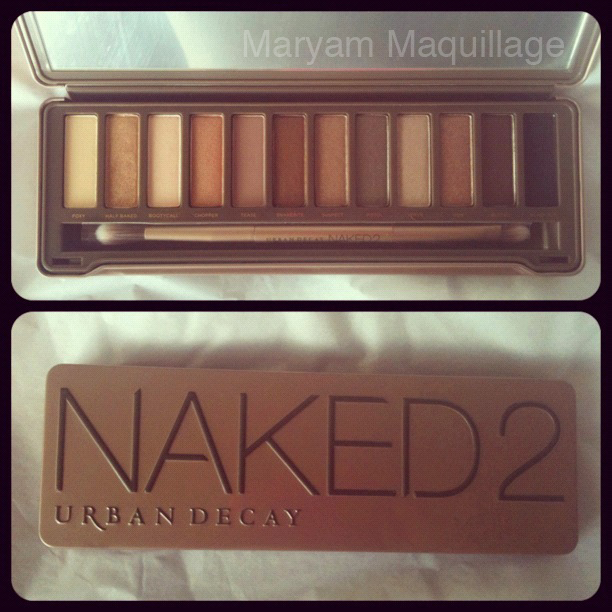 Maryam Maquillage: Now I can be NAKED 2!!! Now I can be NAKED 2!!! Needless to say, I'm overjoyed with NAKEDness!! I finally received my NAKED 2 palette from Urban Decay, thanks to my papa's xmas gift card to UD.com. I feel like I'm the last beauty blogger to post about this, but better late than never, right?! Anyway, I'm über excited and can't wait to share tons of makeup looks using this amaaaazing product. Let me know if you have any requests and I will be happy to fulfill them! For now, I'm going to lock myself in my bedroom for the next several hours and get to know my new best friend :)) Hoooraaaaayyyy!!! Maryam, do you say the name exactly how you spell it? I'm curious. Well my good news is, i finally got my morange. I'm excited too, i was missing a true orange lipstick in my life. Very unique name i love it!!! YAY! I received mine earlier this week but I have yet to make a post (sheer laziness). Will do so soon! lol She's a beauty isn't she? omg! so jealous :L this pallet looks great, soo want this! Urban Decay has the bestt shadows! i haven't bought the second one yet because i'm just obsessed with the first one, but i'll definitely get it one day! cute post! Ah, you got this! It's always sold out when finally want to purchase it. Fingered crossed that I get a hold of this real soon! Can't wait to see the looks you come up with! I want one soooooooo bad!!!!!!! I cant wait to see your new looks SMOKEY SMOKEY I WANT SMOKEY!!! Whoa ! Looks like there is a Naked revolution in the world ! i have naked first version i think both looks same what you say? or should i buy this one too? Don't worry you're not the last. Mine just came in the mail yesterday! haha. Oh, it looks like the Naked pallette is a must have! i really want it but cant afford it at the moment. thank god I have got another urban decay pallete and about 20 different UD eyeshadows. Congrats on getting it darling! this is the palette i wanted to have..
OMG I dream about this palette! great blog ;) I read a and watch for a long time;). I invite you to me. if you want to invite you to follow and for commenting. NICE! I haven't been able to find this at my local Sephora but I think I might be getting the original Naked palette for Valentine's day!